If you need to take a dessert to a holiday get-together this year, I have the perfect thing for you. The nuts are optional. It's great either way. You don't have to bake, transport, or fuss with a pie. And, if the host or hostess has already made a pumpkin pie, you are not stealing his/her thunder. And, most importantly, if you are traveling, you can make this, freeze it, and pull it out of the freezer before you leave for your trip. By the time you get to your destination, it will be defrosted and ready to serve. I love that about this one. 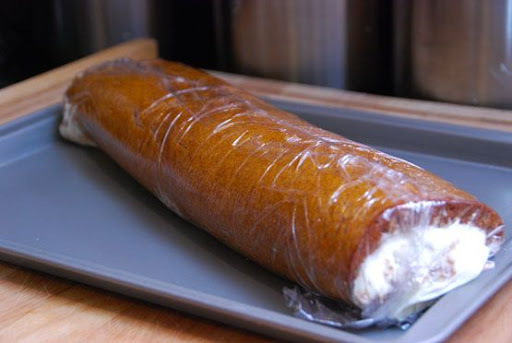 I came up with this recipe because I love pumpkin rolls - but I wanted something that was more than just a cream cheese frosting and pumpkin cake. I wanted something with more pizazz. The streusel filling, paired with traditional cream cheese frosting, adds just the right upscale, and unique, touch. For my first few years of marriage, I was intimidated by a "roll" dessert. What if the cake breaks in half? What pan do I use? I know mine won't turn out. Well, my friends, this one will turn out. 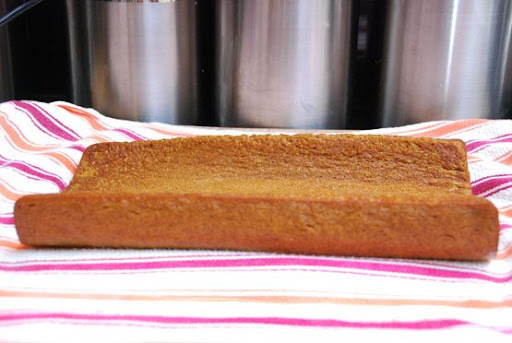 This cake is spongy and forgiving, that it will roll right up for you. I snapped photos and included a short tutorial of the "roll-up" process so that I could show you how I do it, if you've never made one before. The full recipe is below if you just want to get on with the recipe. 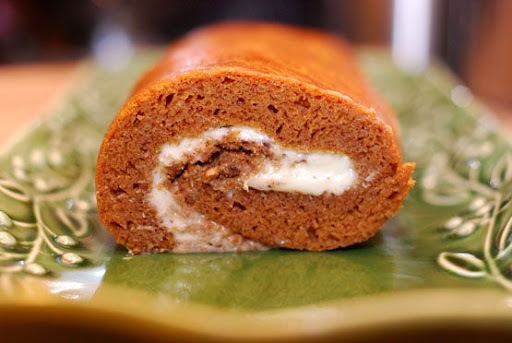 For those who like the picture help, here's how you make this mouth-watering Streusel-Filled Pumpkin Roll. While the cake is baking, make the streusel filling. Combine brown sugar, flour, cinnamon, and melted butter. Stop there if you don't like nuts. If you like nuts, like I do, add 1/2 cup of chopped pecans to the mixture. In a separate bowl, beat cream cheese, vanilla, and powdered sugar to make the cream cheese frosting. Set aside and DO NOT start eating. It will be hard to stop. 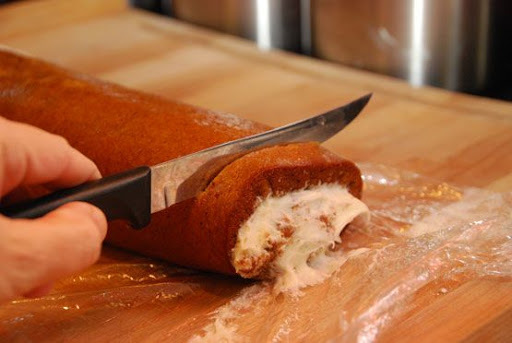 Once the cake is finished, here is how to make the roll. 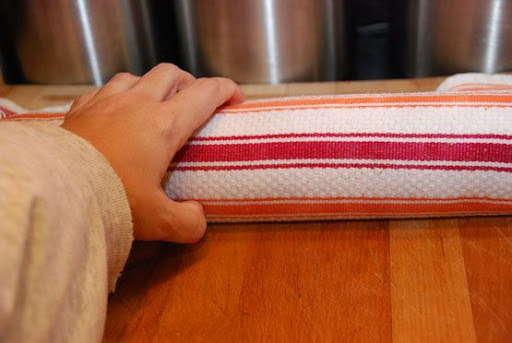 Lay out a kitchen towel on the counter or cutting board. 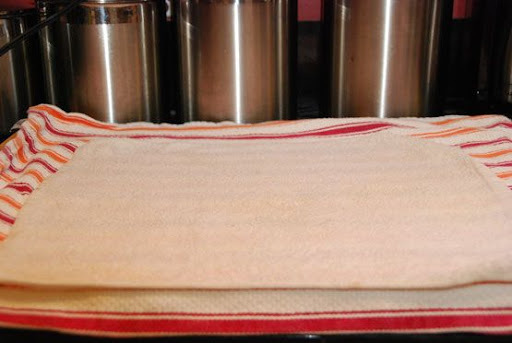 Lay a wet washcloth or smaller towel on top of the kitchen towel. This will dampen it, but not make it too wet. Remove the washcloth. Flip the hot cake out onto the damp kitchen towel. You've essentially made a pumpkin cake tootsie roll. Let it sit for 20 minutes. 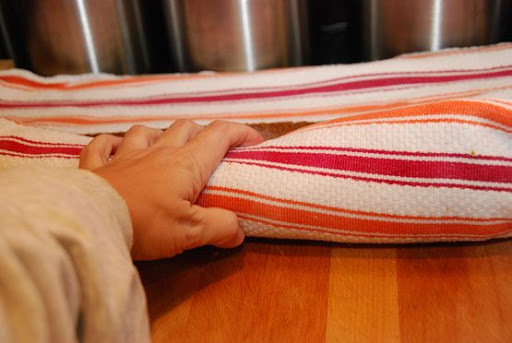 After 20 minutes, unroll the towel. The cake will want to curl back up. That's just what you want. 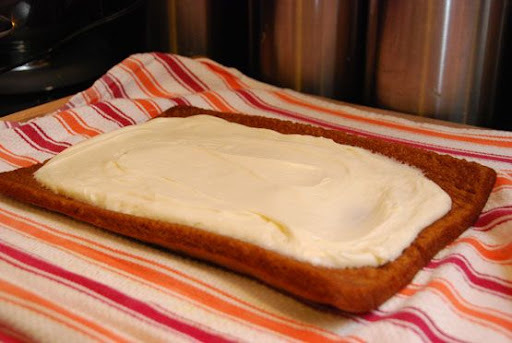 Spread the cream cheese frosting on top. Then, top with the streusel topping. Roll the cake back up again. This time, without the towel. Frosting and streusel may ooze out from the sides. Just grab a spoon and have a snack. If your cake starts to break a bit, no worries. Remove the roll from the refrigerator and slice off the edges. I eat them immediately. I can't help myself. You have now made a beautiful, streusel-filled pumpkin roll. I sometimes top it with powdered sugar when I'm ready to serve it (which works great at hiding any small remaining cracks). It looks like snow - so festive. You can slice it ahead of time, or just set a knife next to it and let your guests slice a piece for themselves. And, there you have it. An beautiful, delicious dessert that is sure to be a hit at your next holiday gathering. Since I've never been a big pumpkin pie fan, I love it when there are other pumpkin things I enjoy on the holiday dessert table. This one fits the bill perfectly! In a medium bowl, combine flour, sugar, salt, baking soda, pumpkin pie spice, pumpkin puree, eggs, and vanilla. Stir until smooth. 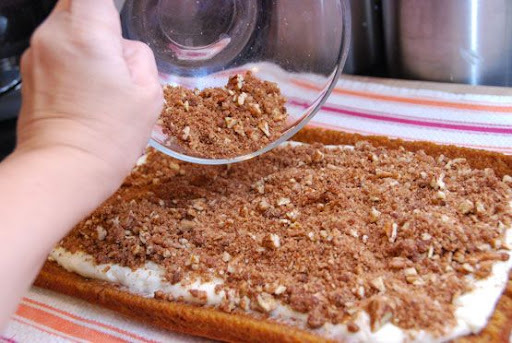 Pour into a greased 9" x 13" jelly roll pan or baking dish. Bake at 375 degrees for 15 minutes. While the cake is baking, make the streusel. Combine brown sugar, flour, cinnamon, butter, and pecans (if desired). Set aside. 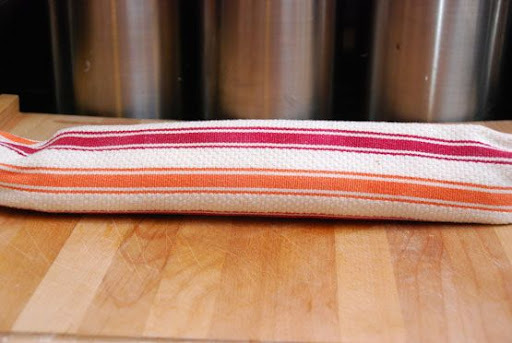 Lay a kitchen towel on a cutting board or counter. Lay a wet washcloth or smaller towel on top. 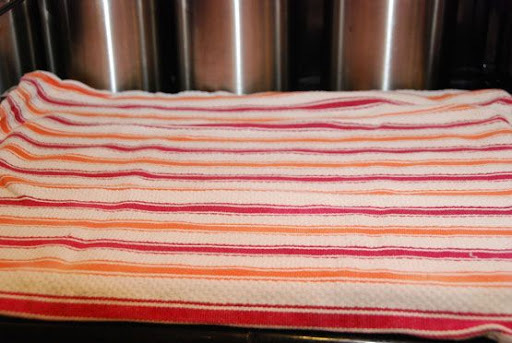 Remove washcloth, and flip cake out onto damp kitchen towel. 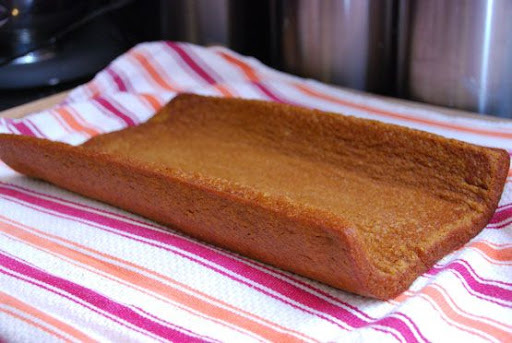 Roll up cake and allow to cool for 30 minutes. While the cake is cooling, make the frosting. 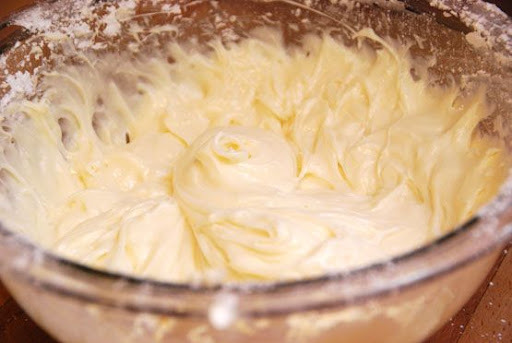 Beat cream cheese, butter, powdered sugar and vanilla extract with a mixer until smooth. 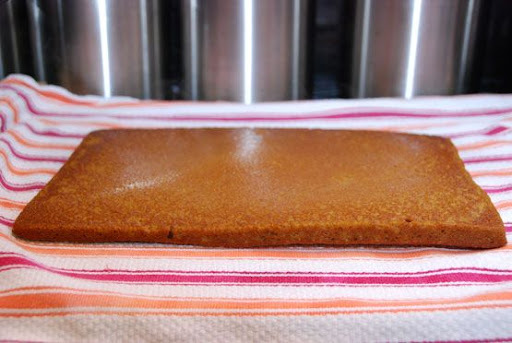 Once the cake has cooled, unroll it and spread on icing. Top with streusel. Roll back up again (without towel), and wrap tightly with plastic wrap. Refrigerate for at least 30 minutes. Top with powdered sugar, if desired, and serve. *This cake can be frozen for up to a month. Thank you! i think I can do this. I will try it for sure and let you know . . .
Brenda - you can do it! DelKee - so can you! This cake is so spongy, it won't break - it might crack a little (like mine did), but it won't break. You can definitely do it!! On a serious note, I made the dip yesterday. And I had to give most of it away because I ate it and ate it and ate it. Wow, I'm so excited. I just looked at the recipe for this on the pumpkin can and got scared thinking I couldn't do it cuz what if the cake breaks. You've convinced me I can and I LOVE pumpkin! Looks good! I think I'm gonna have to make me some. Thanks for sharing as always. Aha! Sarah, you're a genius! My baby is scheduled to be delivered on Nov 30 and there's just no way I want to bake that close to baby explosion d-day. But since I feel great now, I'll make this cake and freeze it, then take it to the family potluck for Thanksgiving. You are a life saver!!! Yum!!! This look absolutely divine. I'll be making this one. 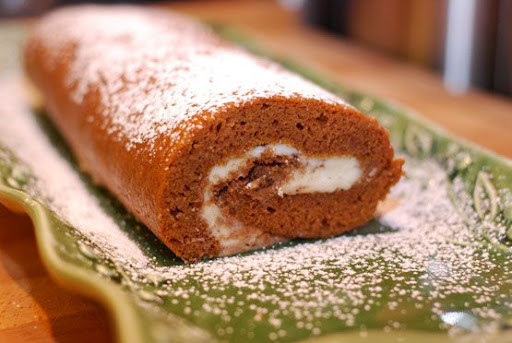 Pumpkin roll is one of my favorite desserts. I think I've gained 4 pounds from that beer bread in recent weeks, too. You're not alone! We have a recipe from Dave's mom that is pretty similar but without the streusel. Sounds really good, Sar. Oh and the pictoral - SO helpful!!! awesome sarah! i never thought to add struesel to this dish!! how wonderful. i usually make my traditional and demanded pumpkin cheesecake, so maybe this year i'll try this instead! 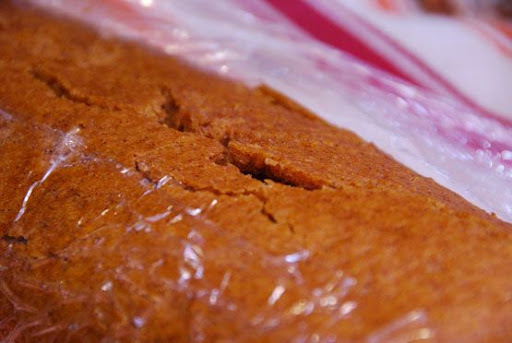 GREAT recipe...one side note, if you're using fresh pureed pumpkin allow more baking time. Like a dummy I didn't think of this AND didn't check as I was following the instructions...needless to say, the cake was too wet to roll nicely. Thankfully, it's just for my family, so we'll enjoy even if it's a bit ugly! :) Thanks for all the yummy recipes! Thank you! I made this last week for the in-laws and it was a hit, so I'm making it again today for my Mom's group. Yummy!! 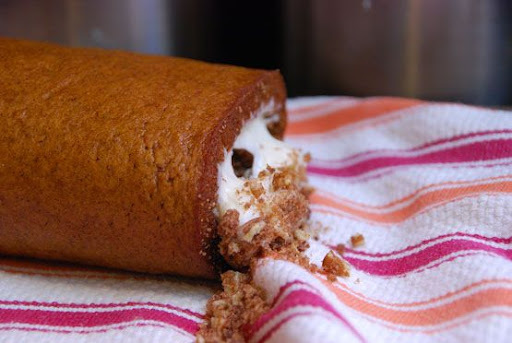 I've made a regular pumpkin roll a million times and have never had one fall apart when I flipped the pan over. I'm not sure what in the world could've caused that. I'm hoping I can still salvage it with the icing and rerolling it. I'm sure it was user error! It looks fantastic! The taste of this pumpkin roll is fantastic! The streusel makes it! Mine wasn't the prettiest, but the taste is wonderful! I would have never come up with the streusel idea! Thanks for sharing the recipe and the pictures!